October 29, 2013-ISNA’s commitment to addressing the rights of religious minorities in Muslim majority countries continued last week with discussions in Dakar, Senegal. Through an invitation from Senegalese president, Macky Sall, a delegation from ISNA visited Senegal to meet with the president, along with other central government officials. 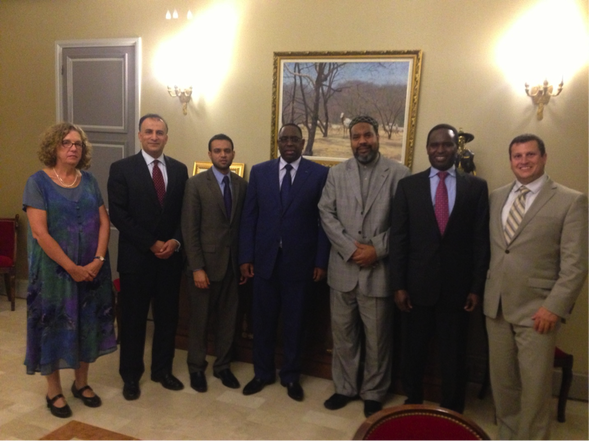 President Sall invited the ISNA delegation to plan on organizing a conference on citizenship and rights of religious minorities in Muslim majority countries, an initiative that ISNA has continued to work on since the recent conferences in Mauritania and Tunisia. Imam Magid, president of ISNA, has met with President Sall twice this year. Last week’s meeting marks the continuation of previous discussions, where President Sall further emphasized his commitment to hosting a conference in Senegal in early 2014. The delegation who met with the president included Ambassador Rashad Hussein, President Obama’s Special Envoy to the Organization of Islamic Cooperation, Dr. Mohamed Elsanousi, ISNA’s Director of Community Outreach, and Sandra Clark, Chargé d’affaires of the U.S. Embassy in Senegal. President Sall was enthusiastic about the impact that a conference such as this, bringing over 40 leading Muslim scholars from around the world and from Africa in particular, will have for ensuring equal rights for religious minority communities in Muslim majority countries. He also emphasized that the consensus building nature of the conference, and a declaration outlining the rights of religious minorities, will ensure peaceful coexistence amongst diverse faith groups. The ISNA delegation also met with the president’s religious advisor to discuss the conference in more detail, who agreed to convene the event in early 2014. In addition to these meetings, the ISNA delegation also met with Senegal’s minister of health to discuss a conference focusing on challenges facing health workers working to eradicate polio. After meeting with Bill Gatesin Doha in April, 2013, ISNA discussed partnering with the Bill and Melinda Gates Foundation to dispel misconceptions about health programs in Muslim majority countries. Imam Magid brought this up with the minister of health, who welcomed the possibility to partner and expand the reach of such programming.